Open areas with brushy edges, especially sandy areas. This bird is identified by its boldly marked head and face. The cheeks and the sides of the crown are chestnut brown. There is a white stripe in the center of the crown, below the eye, and below the cheek; a black line from the bill, through the eye, to above the cheek; and a black line from the bill to below the cheek. The breast is unmarked except for a large dark spot in the center. A variable, melodious song consisting of clear notes, trills, buzzes, and pauses. Omnivorous. Feeds on grasshoppers, other insects, and seeds in Breeding season, seeds in non-Breeding season. Photographed near Mekinock, North Dakota (25 June 2009). Photographed near Kellys Slough NWR, North Dakota (24 June 2009). Lark Sparrow does a subtle display, then takes flight. 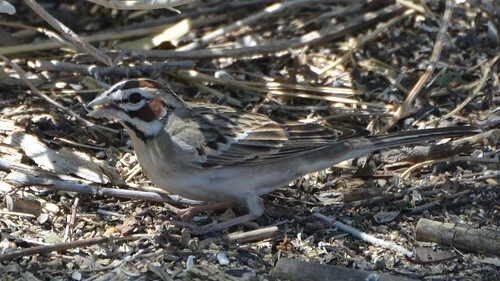 A Lark Sparrow found by Chris Sheirdan on Sat. 11-13-10 at Hampton Beach State Park, NH was still being seen today 11-15-10 just north of the entrance as it foraged close to the road with several Song Sparrows and lots of House Sparrows. 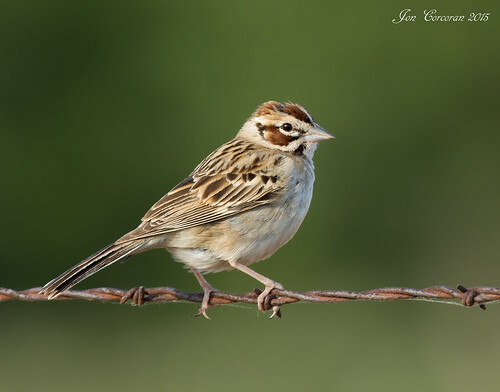 Song of Lark Sparrow, filmed in Tilden Park, Berkeley, CA. First part is camcorder video, second part is sound recorded with my cell phone, with overlays of still taked feom preceding video. All the same bird, same location time etc.